Bheeshma Ekadashi is observed in the Magha Maas which will occurs during the January and February. Fasting on Ekadashi is considered highly auspicious and is believed to help in redemption of sins and in attaining Moksha. On this day people also observe Bhoumi Ekadashi and Jaya Ekadashi. Bheeshma Ekadashi is on Tuesday 7th February in 2017. 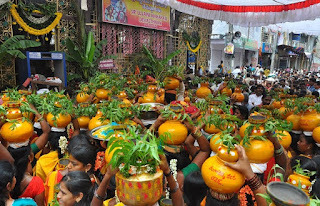 Bheeshma Ekadashi occurs in the uttarayan punya kalam. Bheeshma Ekadashi will be three days after Bheeshma Ashtami. Bheeshma Ekadashi is also called as Matatraya Ekadasi. On this auspicious day of Bheeshma Ekadasi people woke up early and finish their regular activities and observe fasting. As the other Ekadasi's Bheeshma Ekadasi day also same ritual. Listing and chanting Vishnu Sahasranama Stotram is auspicious on this day. The story behind Bheeshma Ekadasi is, Shantanava is the king of Bharat Kandh. Bhisma is the son of the King Shantanava and Ganga Devi. As the starting of Kurukshetra movement Bheeshma was uneasy. But it is not because of death as he has boon to wish the death is on his own hands. He knows truth will won the war. But he was thinking about upcoming future. At any circumstances one more Duryodhana should not come to authority, No more Shakuni can mislead the rulers. No more Dharmaraju to be injustice, Kurukshetra movement shouldnot happen again. Bheeshma knows dharma should not be ruin with him they must be turn for the upcoming future. So, Bheeshma decided to say dharma as he don't have any relations now. Bheeshma explained how a ruler will be and what he has to do for the people. The ruler what he has to do for society when he is taking important decisions. As this is explained by an example of peacock, As it impress by exclamation, The ruler should impress people by his lecture. The ruler should be always do justice and should eliminate the bad. Bhisma fights 9 days in Mahabharat war. On 9th day he leave his arrows because of Shikandi. Who was born to kill Bhisma. When Bhisma was about to fall on earth Arjuna built Shayya. Arjuna built with arrows it is called Ampa Shayya. 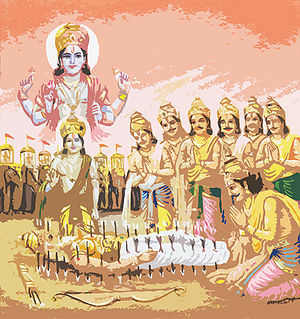 Bhisma slept on Ampa Shayya until Uttarayan. because Bheeshma has the boon to die on his wish he waited until Uttarayan that is the good time to leave the soul. On this day, Vishnu Sahasranama Stotram was revealed to Pandava's by Bheeshma in the presence of Lord Krishna. As we believe that listening to Vishnu Sahasranama Stotram leads to Moksha. So, it is considered as the birthday of Vishnu Sahasranama.